Surprisingly Ricky Ponting tops this list. He has had mixed memories at this ground, from making his Test debut here in 1995 against Sri Lanka and given out leg before wicket unfortunately on 96 to being a victim of a magnificent spell from the then-rookie Ishant Sharma in 2007. Yet Ponting has 946 runs in 15 Tests he has appeared in on this ground with an average of 43, with his highest score being 197 against Pakistan in 1999. Though he will itching to score bigger this time around, now that he seems to have got back his rhythm after scoring his 40th Test century at the SCG. Allan Border, Australia’s 1987 World Cup winning skipper comes second with 931 runs in 16 Tests while David Boon and the Waugh brothers complete the top 5 highest run-scorers at this venue. In terms of foreign players, if you thought that it was Sachin Tendulkar who is the top run scorer at Perth, you are mistaken. It is England’s evergreen batsman David Gower who holds that honour with 471 runs in 5 Tests at a terrific average of 52.33 and a highest score of 136. Steve Waugh leads the pack of batsmen who have scored as many half-centuries as possible on this ground. He may have scored no century on this ground, but in the 15 Tests he has appeared in Perth, he has scored eight fifties with his highest being an agonizing 99 not out against England in 1995. Ricky Ponting, Allan Border and David Boon have all scored six fifties each jointly holding the second place in this list while Mark Waugh, Adam Gilchrist and Michael Hussey have four fifties each with Hussey still playing for Australia and hoping to fire in his hometown. This has several record-holders. Amongst the players from the old times, players such David Boon, Allan Border and Mark Waugh have two centuries each to their name at the WACA with Boon being the first man to score a double hundred on this ground before Michael Slater overtook his score to make 219 against Sri Lanka in 1995. Adam Gilchrist also has two centuries on his home ground, but the most memorable one will be the century against England in 2006 which he hit off just 57 balls, making England pay the price for being slightly relaxed and the world realize that Australia had immense depth in their batting line-up. This remains the second fastest century of all time, as Gilchrist missed the world record by one ball. This is not as astonishing as the previous record. The ‘Pigeon’, Glenn McGrath has the maximum number of wickets by any bowler at the WACA, with 52 wickets to his name in just 12 Tests with his best being a monstrous 8/24 against Pakistan in 2004 in the second innings. The manner in which McGrath is similar to Ponting is that he too made his debut on this very ground, but in 1993 against New Zealand. Unfortunately, McGrath no more plays cricket but it was a delight to watch him bowl in conditions which favour his type of bowling. Brett Lee comes second in this list and this too is not stunning considering the pace the wicket can generate, for bowlers like him. Lee relied very much on his speed and the outcome at the WACA was 40 wickets in 8 Tests he played here. Merv Hughes and Craig McDermott were one of the most potent fast bowling pairs in their time and they had a ball at Perth by wrecking batting ships. Surprisingly, Shane Warne too has been successful at this ground but this goes to show the skill he had with the ball as he managed to pick 37 wickets in 12 Tests here. In terms of foreigners to have done well here, Curtley Ambrose of the West Indies tops the list with 24 wickets in just 3 Tests as he reveled the most in these conditions with his best match figures being 9/79. Merv Hughes is No.1 in this list alongside Curtley Ambrose and Richard Hadlee. These three are undoubtedly the greatest ever fast bowlers to have ever played the game and Perth was a way to celebrate their legacies. Ambrose picked atleast one five wicket haul in average since he only played 3 Tests here while Hadlee picked a 11/155 in one match that he played. Amongst the current crop of bowlers, Brett Lee and Mitchell Johnson have two 5-wicket hauls each on this ground. Ironically though, both of them are not a part of the Australian Test team with Lee retired from the format and Johnson out of the side temporarily due to injury and the Test against India will be the first that Johnson will miss at Perth since his Test debut. Although the WACA does not generally support batsmen, the highest total ever made on this ground is a mammoth 735 for 6 which Australia scored against Zimbabwe in 2003. This match is remembered the most for Matthew Hayden scoring 380, breaking Brian Lara’s 9 year old record of the maximum individual score in Tests by any batsman which was 375. Australia went on win this match comfortably, by an innings and 175 runs. Ricky Ponting’s debut was not only memorable for him but also for the Australian side who put a rare but breathtaking batting performance against Sri Lanka in 1995. After bowling out the Lankans for 251 in the first innings, Ponting’s 96 alongside a double century from Michael Slater and some other impressive contributions made the captain Mark Taylor declare at 617 for 5 which gave the hosts enough time to post an innings win over the visitors. England out of them all scored 592 for 8 in the 1986 Ashes Test and that remains the highest total by a visiting team at Perth. Luckily for Australia the match ended in a draw as England were in command for a major part of the game. The then-great West Indies team scored 585 in 1975 and posted their only win in an otherwise disastrous 6-Test series for them. While New Zealand batted exceptionally well in 2001 to get to 534 for 9 and achieve another draw in what was a drawn series against the world champion and in-form Australian side. This record undoubtedly goes to South Africa who were outstanding in their run-chase of 414 against Australia on this ground in 2008, winning eventually by 6 wickets. Australia were on top for the first three days of the game with decent batting performances and bowling out the visitors for 281 in the first innings, which got them a handy 94 run lead. South Africa were expected to choke as always, but they do have their days. This run-chase was reminiscent of the near to impossible 434 scored in the Johannesburg ODI in 2006 by South Africa against Australia. It was a total team effort with hundreds from the captain Graeme Smith and AB de Villiers who remained unbeaten till the end and fifties from Hashim Amla, Jacques Kallis and out of them all the debutant, JP Duminy who made a name for himself in the match. Australia’s bowling had never looked this vulnerable and it signaled their decline in Test cricket. In the 2001 game, Australia were put to the sword by an inspired New Zealand side led by Stephen Fleming and somehow pulled off a draw after ending with 381 for 7 to avoid a humiliating home series defeat against their Trans-Tasman archrivals. While in 2006, England managed to score 350 in the second innings but even that was not enough to hand them a massive 206-run as Australia regained the Ashes once again. While Australia scored 342 and 340 against India in 1977 and 2008 respectively. So the WACA has not been that horrible a pitch to bat on in the fourth innings after all. England and New Zealand are equal in this aspect, with 3 draws each. England did so in 1970, 1982 and 1986 out of the 12 Tests they have played in this ground while New Zealand did so in 1989, 1993 and 2001 out of 6 Tests. South Africa also managed to draw a Test against the rampant Australia on this ground in 2005. England are on top when it comes to holding this record as well with a shocking 8 defeats in 12 Tests, including the sole loss in the Ashes 2011. Pakistan come second with 5 defeats out of 5 at Perth, this being one of the worst grounds for them. 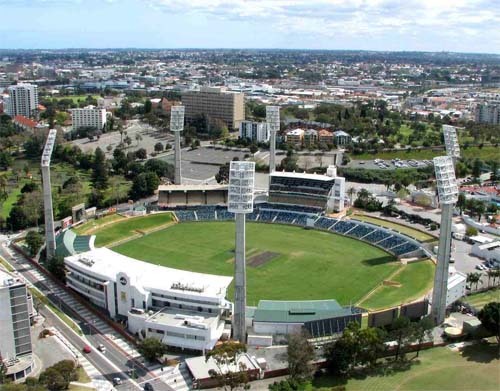 While New Zealand, India, Sri Lanka and West Indies have suffered two losses each at the WACA. For a change, West Indies is No.1 on this list with 5 wins in 7 Tests against Australia, making them the most successful team against Australia on what has otherwise been a happy hunting ground for them. Most of the victories that the Windies achieved were in the 80s when they were in their prime. Apart from Pakistan, Sri Lanka and Zimbabwe all the other Test-playing nations have managed only one win so far on this ground against the hosts. This has been a historic ground and a victory here is always prestigious for a visiting side with Australia winning 22 and losing only 9 out of the 38 Tests played here. India won the last time around, in 2008 and would be hoping to take some inspiration from that victory to repeat that success this time as well and keep their chances alive of leveling the series. But one more mistake and Australia could inflict a misery similar as 1999 on the Indians, to reclaim the Border Gavaskar Trophy.